One thing I have noticed about most furniture...... It rarely serves more than one purpose. 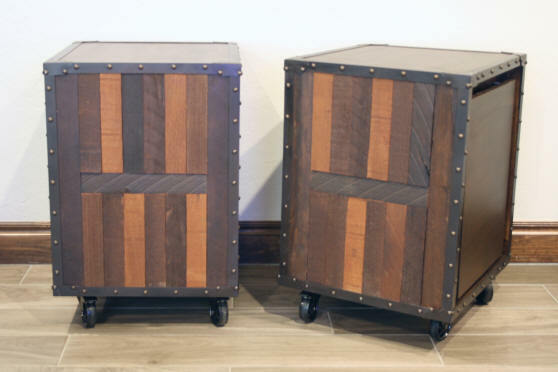 An end table usually has four legs and a flat surface. You can only set a lamp or other stuff on top of it. The space under the table is dead space. Unless you stick something underneath it. A nightstand will usually have more functions...like a drawer or cabinet underneath to hold items. - Functioned more like a nightstand with storage underneath. - Be on wheels, so they will be easy to move around. 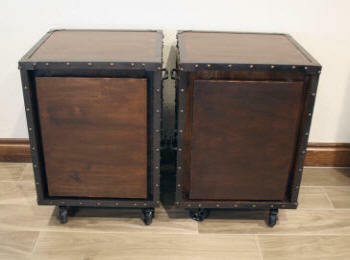 I also wanted the style of the end table/cabinet to have an industrial or rustic style. 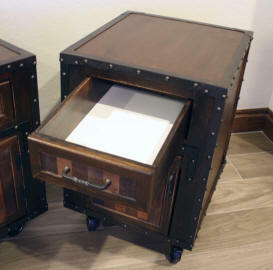 I wanted the end table/cabinet to match the Rolling DVD Cabinet and File Cabinet that I had already made (see below). 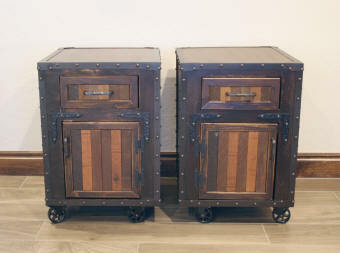 The File Cabinet has the fold-up tables that I plan to use on the end table/cabinet. The other reason I wanted the industrial style of furniture is, our dogs. All furniture that I am making or have bought recently, that is in an open area of the house (can not be closed off with a door), is dog protected. Whenever you have dogs, there will be some chewing on the furniture or anything else that is wood. There is also the occasional territory marking pee. All of our dogs are trained and rarely chew or pee on the furniture, now that they are all adults. But sometimes there are stressor accidents......a clap of thunder.....a squirrel in the backyard....a horseback rider passing by. 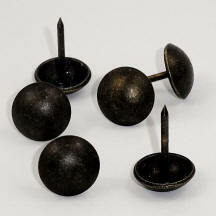 To protect the furniture, I place metal on the exposed edges. There are metal or wheel legs. 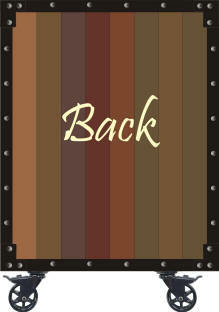 Paint on all surfaces, including underneath and inside.....to protect the wood from moisture. As with my other projects or designs, I went to my graphic program to create and work-out the details of this end table / cabinet. 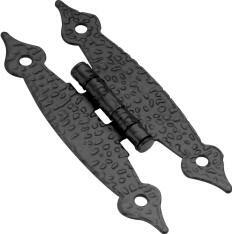 The casters I plan to purchase are 4" high (3" wheels). I decided on an overall height of about 26.5". So the cabinet without the wheels will be 22.5". For the width and depth dimensions, I decided on 18" as my lumber cutting size. The depth will increase when the back and front trim are added. The finished width of the front and back will remain at 18". The front of the end cabinet will have a 5" high drawer on the top and a cabinet on the bottom. The cabinet door and drawer opening is 12" wide so the drawers and cabinet doors will be 11.75" wide. 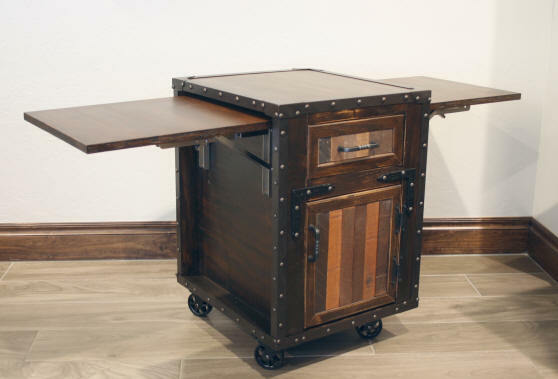 Proposed design for end table/cabinet. The trim on the front will measure 3" wide for the vertical pieces and 2" wide for the pieces above and below the drawer. 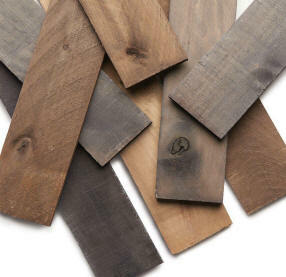 Weathered boards will be used as decor on the front of the drawer and cupboard door. For the back of this cabinet, it will be decorative. The reason for this is our "open concept" living room. The furniture for sitting does not go against any wall. Therefore, the back of the end cabinets will be visible. Might as well make it look nice. Weathered boards will be added to the back. The 2 end pieces of the weathered board will be 3" wide. This is because the aluminum angle will be covering one inch of it. This way all of the boards appear 2" wide. Each side of the end cabinet will have a fold-up table. The table will be housed inside of the recessed area. 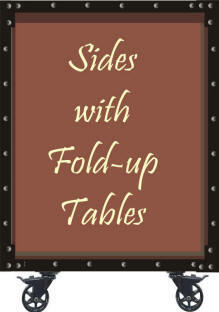 Simple folding shelf brackets will hold the table in-place. 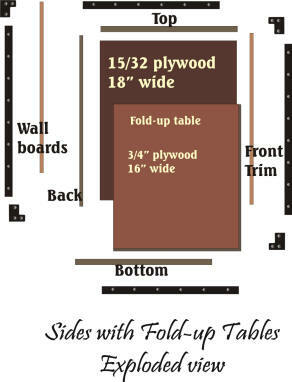 If you are making this end table / cabinet you will probably want to make it out of 3/4" wood. 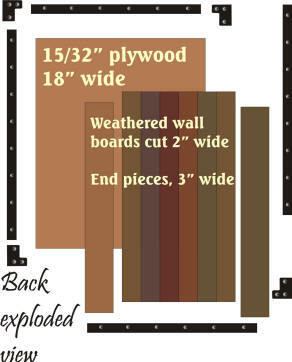 Here are the dimension of wood you will need in the graphic below. You will need 2 of each except for the back if you are only making one cabinet. 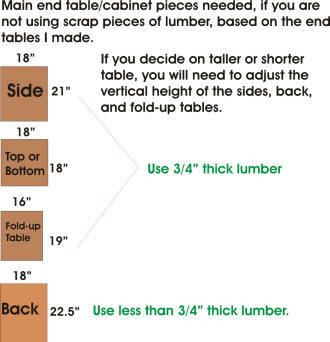 If you decide to lengthen or shorten the height of the end cabinet, you will need to adjust the measurements given above. For the drawer, trim, and cupboard door, it is best to assemble the main pieces first and then measure and cut your wood for these parts. This will allow you to tweak the measurements a bit if the main pieces assembled are slightly off. No matter how hard I try, I sometimes have to tweak measurements 1/16" or 1/32" to have an exact fitting piece. This project will also be the project where I get rid of all the scrap lumber I have accumulated from the last three projects. I have collected so much loose lumber that storing it, has become a problem. Since these end tables / cabinets are small, this is the perfect opportunity to get rid of most of it. Because I am using scrap lumber, it is not as thick as I would want for furniture. I prefer furniture frames of 3/4" lumber. For backs, drawers, cupboard doors, etc......thinner wood is OK. So in areas that the lumber was thinner than I liked, I made some modifications to the furniture pieces. I doubled up the 1/2" lumber on the bottom and adding a strip of lumber to the bottom of the 1/2" sides so that there is more contact with the bottom piece. Because I had a lot of slim pieces of lumber, there are two furniture pieces that are two pieces instead of one. One part of the bottom is two pieces and the back is two pieces. How I used up my scrap lumber for this project is shown below. Please keep in mind that I am making two end cabinets. Using scrap lumber I cut the following lumber pieces for two end cabinets. Some bottom and back pieces are half pieces. For the top, sides, and fold-up tables, I had enough whole pieces of lumber. The back pieces were then cut in two pieces adding on the .25" length. The 2 pieces will not be noticeable in the end because the weathered boards will be placed over the back. For all of the other pieces needed for the end cabinets, I used scrap wood. For the trim, I used 3/4" lumber. For the drawers, I used the 15/32" plywood and a dry erase board for the bottom of the drawers. 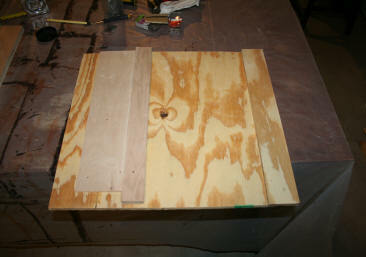 For the cabinet door, I used 15/32" plywood. I also used scrap wood for the trim support under the bottom drawer trim which will also help guide the drawer. A piece of wood glued to the top that was then screwed to the side, which firmly secures the top to the sides. Besides the wood, I had to buy everything else I needed: The paint, aluminum angles, drawer pulls, upholstery tacks, spray paint, folding table brackets, weathered wood, casters, hinges, weathered pine trim, (for the drawer and cabinet door), dry erase board (drawer bottom), corner protectors and corner supports. I bought this reclaimed wood online for Rolling DVD Storage Cabinet. 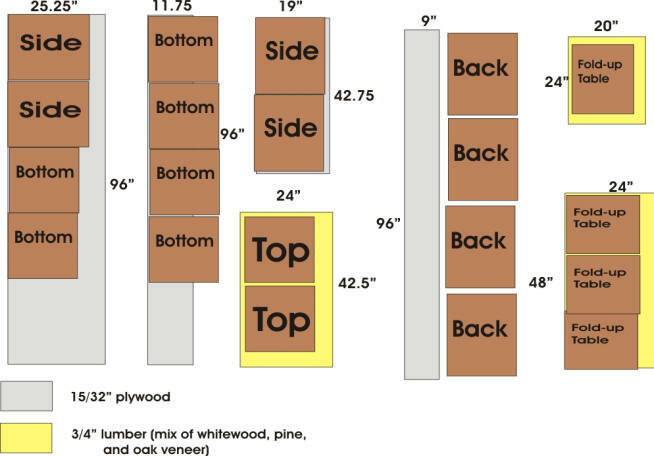 I have no idea where I can find a lumber yard in my area that will have reclaimed lumber. This was the cheapest boards Home Depot had. I could find nothing like this at Lowes. This style of caster has a retro look, which is why I liked it. 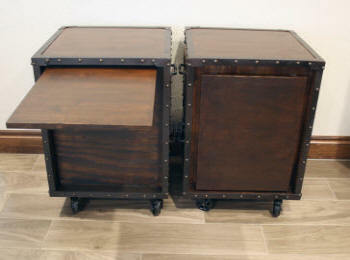 It is similar to the wheels on the Rolling DVD Storage Cabinet. 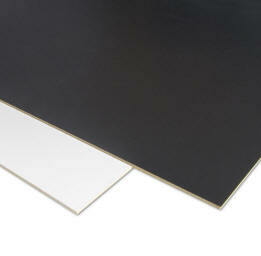 It also has polyurethane wheels which are much better for ceramic tile floors. I would have preferred non-locking casters for this piece of furniture, but the locking was the only option available for this style. 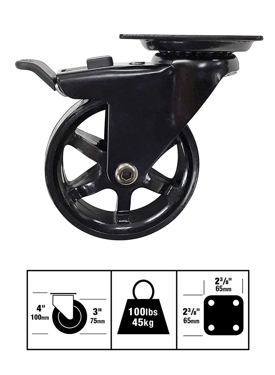 Each caster can support 100lb. The end cabinet will never hold that much. 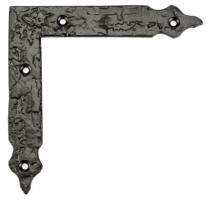 You have to be careful ordering this type of folding bracket. I made the mistake of looking for a cheaper folding bracket than the one below. 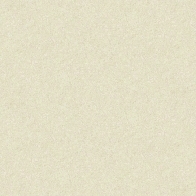 The bracket shown below was perfect. Should have stuck with it from the get go. For the tight space on the side 1.75", you need to make sure that the bracket, when closed, folds your shelf and holds it flush to the side, completely vertical. The cheaper bracket I initially purchased for this project, did not allow the shelf to lay flat, it flared out at the bottom two inches. The lever that you pull-on to close the bracket, popped it out. 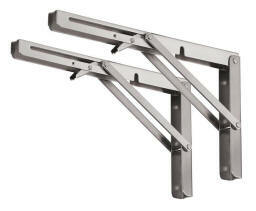 The Yumore bracket below, has a lever that collapses flat against the surface and does not push the bottom out. What I needed. The cheaper brackets I did not use? I will use them on another fold-up shelf project, that does not require that the shelf be as close to the vertical wall of the furniture or actual wall. They had a black painted surface that got scratched up a bit, so I could not return them. Bought 4 sets of 2. 2 sets for each table. There are 2 different sizes of cabinet pull; 3" and 4". When I made the Rolling DVD Cabinet I used the 3" on the cabinet doors. I did not notice the 4" OR it was not on the website when I was looking. I would have preferred the 4". Changing it would mean drilling another hole in the doors and filling a hole. I am not going to bother. I had two more 3" pulls which I used on this cabinet door because it is small. I used 4" on the drawers because they will be used more. Instead of wood on the bottom of the drawers, I used dry erase / chalk board material instead. The drawers are small so they don't need a heavy weight material on the bottom. I placed the white side up in the drawer so that items inside can be seen easier. Because I was using a lot of scrap lumber, I needed to beef-it-up in some areas. If you are using all 3/4" lumber and not 1/2" scraps, like me. 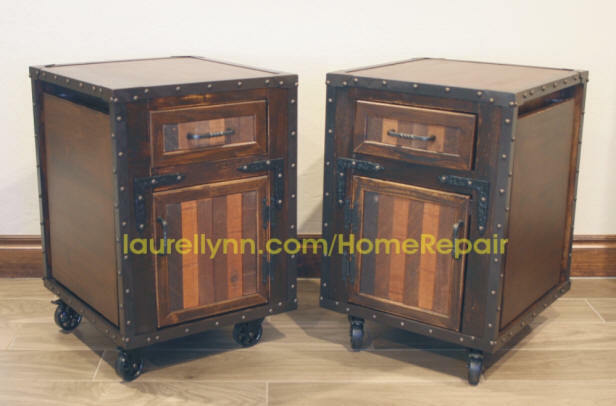 You only need to add scrap strips of lumber to the underside of the top piece and along the side where the bottom of the drawer and front trim piece will go. Scrap lumber being added to the side to beef-up my 1/2" lumber. 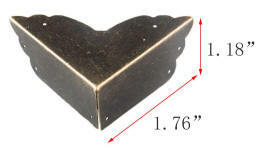 If you are using a side piece that is 3/4" thick, you would only need to add the piece that will go below the drawer. For the top, you will need to add some scrap lumber or trim, at least 3/4" thick, to the underside. You can nail it or glue it. This will allow you to attach the top to the sides through the sides. On the bottom, the screws will go straight rough the bottom into the sides. I just used glue because adding the back and the front trim pieces further keeps the whole piece of furniture together. The back and trim pieces were nailed on. After this point, I neglected to take any pictures until I was done with the end cabinets. 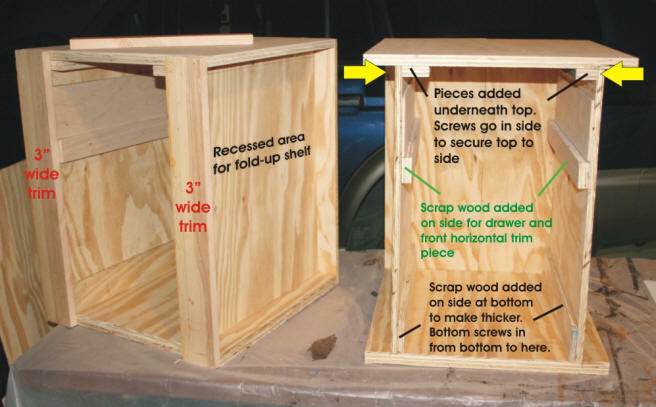 You can view the assembly process for either the Rolling DVD Cabinet or the File Cabinet, which were built in using the same methods. After assembling all of the pieces, I painted everything. One coat of the 32 oz can Minwax Polyshade Satin finish - Espresso (used almost whole can) and 2 coats of a 32 oz can Minwax Polyshade Satin finish - Pecan (about half a can). The Espresso is a very dark color. Since I was painting mostly plywood, the wood soaked up the paint. I used less of the Pecan because it was not being soaked in. After applying the Espresso and it had dried, I sanded the wood until enough grain was showing through. 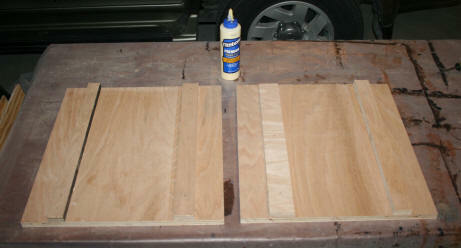 Then the Pecan was applied, sanding between coats. For the top of the end cabinets and the folding shelves, I added a third coat of Pecan. This is to protect them from food and liquid. The casters were then added on the bottom of the end cabinets to make them easier for me to move around the garage while I worked on them. When the end cabinets were constructed, the back of the cabinets just had two scrap pieces of 1/2" plywood on the back. One piece was particularly gnarly with a 3 inch knot. cut and glued onto the plywood back. Since these cabinets will be rolling around the living room daily, the back needed to look decent. The weathered wall boards were glued onto the back following the exploded view above, with 3" wide boards on the end and 2" wide boards on the rest. I modified the design a little bit. After the 3" wide pieces were added, I placed a 2" wide horizontal piece in the middle to break up the space. Then I cut smaller vertical 2" pieces to fill in the space. 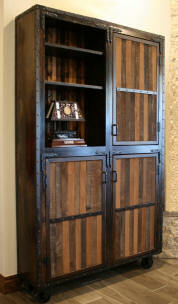 Two coats of Pecan were painted onto the weathered wood back. The weathered board was placed on BEFORE the metal edges were installed. This is for two end cabinets. If you are only making one, cut the amount in half. 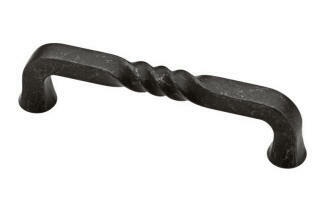 8 - 16" - for for horizontal top front, top back, bottom front, bottom back. 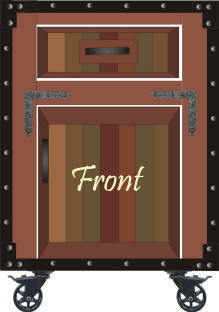 8 - 21" - for all four vertical edges of both end cabinets. Of note....the angles did not need to be the exact edge dimensions of the cabinet because the corner protectors will be installed on top of the angles. So I cut pieces shorter than the cabinet edges. The aluminum was then sanded down to rough-up the surface. 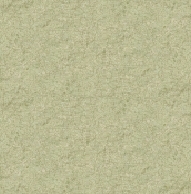 I sanded lengthwise kind-of creating a grain. The angles were added onto the cabinet after all of the wood painting was done. Metal corners were then installed over the edges of the angles. I use clear caulk under the angles to glue them in place. 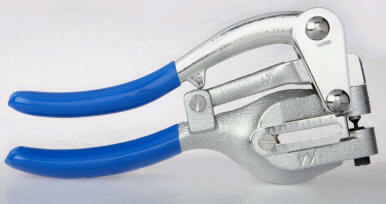 Why clear caulk? Less runny than glue and dries clear after a few days. After the angles were installed on the edges, I installed the four folding shelves after painting them. The shelves are nothing more than a 3/4" piece of lumber cut 16" x 19" and held in place with the folding shelf bracket. When a shelf is open, it can be rolled around to where it is needed. After using this folding shelf as a TV tray, I have found that it is sooooo much more easier than one of those folding TV trays. First off, you can move this shelf close to you as you sit on a couch. With the folding TV trays, you are stuck sitting on the edge of the coach and leaning forward. Second, it is more stable. Less chance of a dog bumping a tray and spilling the contents. Third. You just fold it down, and it is out of the way. 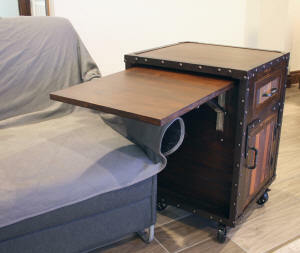 With a folding TV tray....you have to store it somewhere when you are done with it. The drawers are nothing more than a simple box. I used scrap 1/2" plywood for the sides and the dry erase board for the bottom of the drawers. 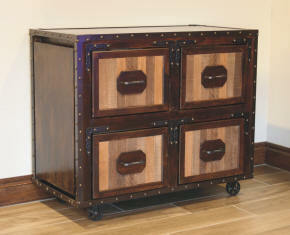 I originally had 4" high drawers in the design phase but changed it to 5". The width of the drawers are 1/4" smaller than the 12" opening. No glides were used because the drawers are small and lightweight. See File Cabinet drawers for more details. For these drawers, I used glue and screws to hold them together. For the cabinet door, I just used a rectangular piece of 1/2" plywood, cut to fit just inside the opening. This trim was glued and nailed directly onto the drawer front and cabinet door, after cutting it to size to frame the surface with mitered cuts on the corners. The drawers and cabinets doors were then given one coat of the Espresso paint on all surfaces. The weathered wall board was then cut to fit. For these surfaces, I cut the weathered board 1.5" wide. This way, I had an even amount of boards in the space between the frames.